Published February 26, 2019 at Words Of Hers. ‘Being a Canadian woman writer of European descent, I came into Fauzia Rafique’s The Adventures of SahebaN without background knowledge of the role (Mirza) Sahiba plays in much of traditional Punjabi culture. The beauty of Rafique’s text however, is how my lack does not impact my understanding of how the narrative turns a cultural model for perfection (Sahiba) on her head to showcase the flaws of that very perfection, and (in particular) to show that a woman can be honourable, and pure, and loyal, without bowing to the restrictive ideas and expectations that society and religion place upon her. ‘Right away announcing her departure from the traditional “folk” Sahiba, Rafique creates her double in SahebaN, the Relentless Warrior. From the moment she is born, SahebaN questions those around her; but in a world where questions from a woman, and especially a brown one, are not taken seriously, she finds only silence. Readers soon recognize her universe as a barely veiled image of our own, led by none other than Civil Magicia, a “fantastical” governing head that perpetuates inequality, and which seems dedicated to controlling the natural chaos of humanity. Yet, as our uninhibited (and repeatedly misinformed) SahebaN rises and falls through CM’s imposed hierarchies, readers get the chance to rejoice through her struggle as she continually flouts the very authorities trying desperately to regulate her existence. Jessica Barratt is an author and editor who founded Words of Hers, the home of JBEditing and The (Almost) Daily. Visit her ‘Loving Edits’ Facebook page at the link below. 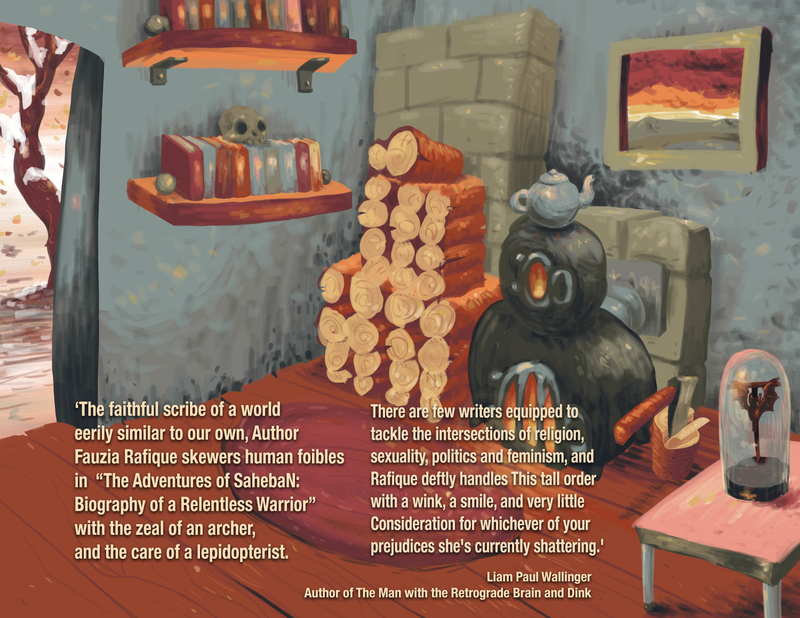 The faithful scribe of a world eerily similar to our own, Author Fauzia Rafique skewers human foibles in The Adventures of SahebaN: Biography of a Relentless Warrior with the zeal of an archer, and the care of a lepidopterist†. 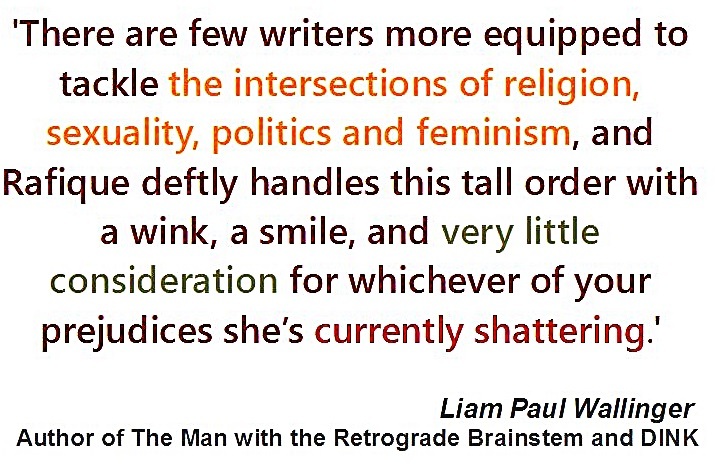 There are few writers more equipped to tackle the intersections of religion, sexuality, politics and feminism, and Rafique deftly handles this tall order with a wink, a smile, and very little consideration for whichever of your prejudices she’s currently shattering. People talk about “devouring” a book that they cannot put down. You will not devour this book; you will be devoured by it. Without warning, SahebaN performs a rude trick on you: You’ll find yourself questioning the line between reality and fantasy. 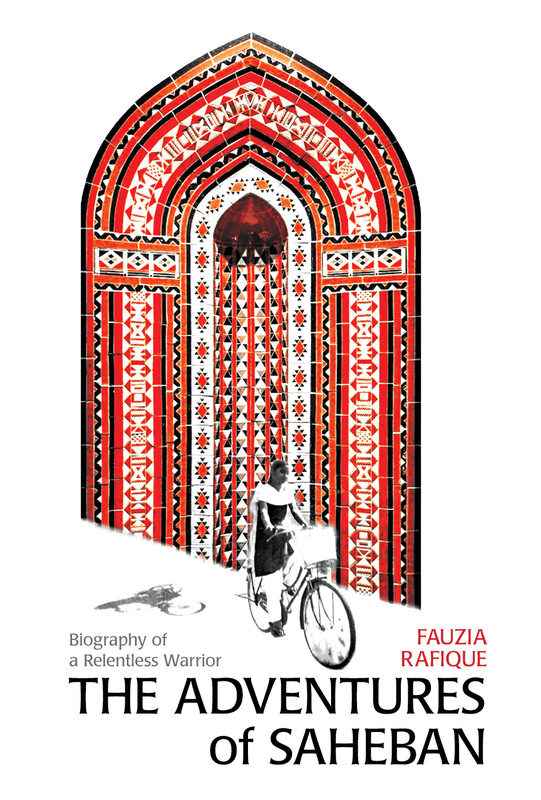 Through her wonderful fictional biographer character, Ego Feathers, and her protagonist’s presupposed folk hero status, Rafique playfully leads the reader on a journey through time and between layers of fiction, like some kind of trickster demigod psychopomp‡. After SahebaN knocks you off your feet and you find yourself treading water, just look up, and you might see Ego Feathers, dancing atop the waves like a Jesus Christ lizard. This is all to say that The Adventures of SahebaN: Biography of a Relentless Warrior is hilarious, transformative, engrossing, and heartbreaking. †One of those disturbed individuals who collects butterflies and impales them on corkboard in the name of science or hobbyism. ‡A being that acts as a guide to mortals visiting either the world of the subconscious, or the land of the dead. ‘Living Room’ by Liam Paul Wallinger.